Open Meetings – Open A.A. meetings are open to all who are willing to respect the anonymity of our members. Closed Meetings – Closed A.A. meetings are limited to persons who desire to stop drinking. 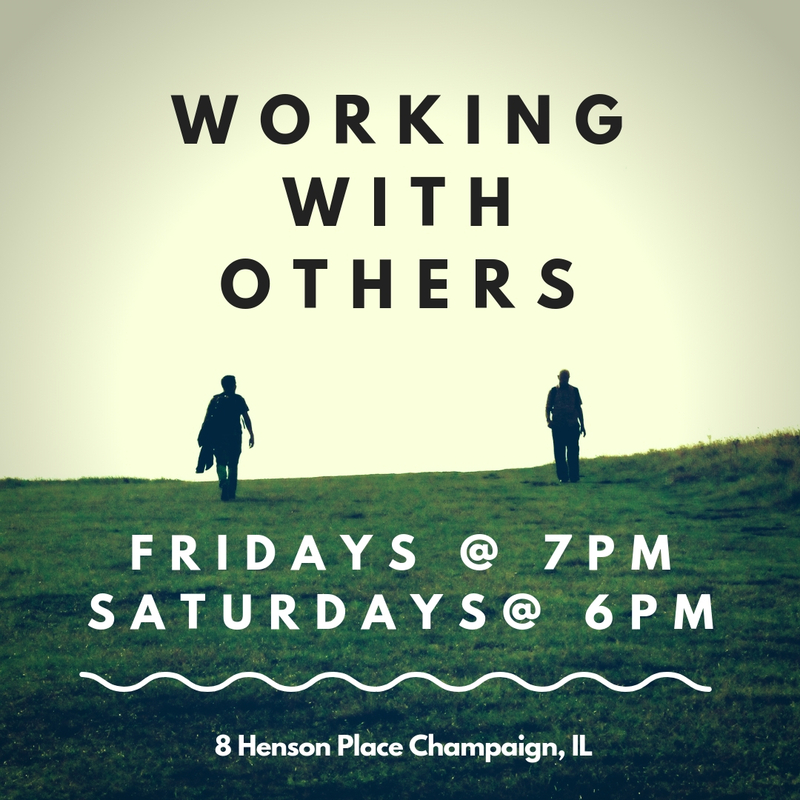 This list includes meetings in the following locations: Arthur, Bondville, Champaign, Charleston, Danville, Farmer City, Mahomet, Mattoon, Monticello, Oakland, Paxton, Rantoul, Savoy, Saybrook, St. Joseph, Tilton, Tolono, Tuscola, Urbana and Villa Grove. 12:00p Recovery Room (O) 1205 S. 9th. 12:00p Brown Bagger, (AC, O, WC) Serenity Shack, 117 N. Ohio St.
9:00a Tilton AA Group, (CL) 612 West 5th St.
1st Tuesday: Step Study Mtg. 2nd Tuesday: Tradition Study Mtg. 3rd Tuesday: 12 Concepts Study Mtg. 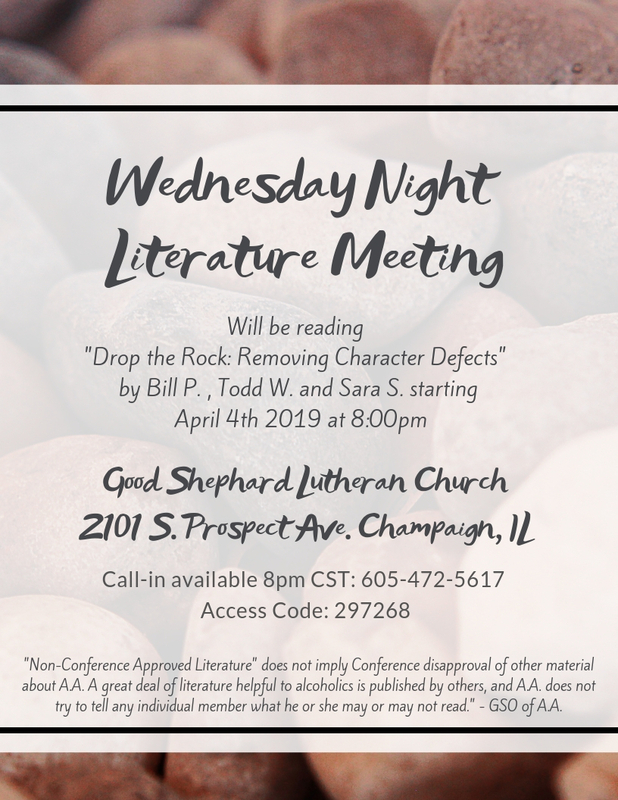 7:30p Tuesday Meeting (CL, WC) Paxton United Methodist Church (basement), 210 W. Center St.
12:00 Brown Bagger (AC, O, WC) Serenity Shack – 117 N. Ohio St.
8:00p Tolono Closed Group (CL) Presbyterian Church, 104 E Vine St.
5:30p Unity, Service, Recovery (AC, CL, WC) Unity Church – 1206 E. Main St.
12:00 Brown Bagger (AC. CL, WC) Serenity Shack, 117 N. Ohio St.
6:30p Love and Tolerance (AC, O, WC) Serenity Shack 117 N. Ohio St.
8:00p Good Old Closed Meeting (CL, AC, WC) Westminster Presbyterian Church. 1700 Crescent Dr.
6:00p A Sufficient Substitute (CL, BB, AC, WC) Immanuel utheran Church, 902 Cleveland Ave.
9:00a New Hope Group (CL) Danville United Church of Christ, 618 E. Main St.
12:00p Brown Bagger (AC, O, WC, BB) Serenity Shack, 117 N. Ohio St.
6:30p Sisters in Sobriety Candlelight (AC, O, W, WC) Serenity Shack 117 N. Ohio St.
5:30p Unity, Service, Recovery (AC, CL, WC) Unity Church, 1206 E. Main St.
6:00p Many Paths (Agnostic, Secular, O, L, AC, WC) Unitarian Universalist Church, 309 W. Green St.
7:00p H.O.W. Candlelight (AC, WC, CL) OSF Healthcare, Auditorium B, 1400 W. Park Ave.
8:00p Thursday Meeting (O) VFW Hall, Main St.
7:00pm Arthur Meeting (CL, WC) First United Methodist Church, 128 E. Illinois St.
12:00p High Noon (CL, AC, WC) 720 4th St.
8:00p Charleston Friday Night Mtg (CL, AC, WC) Presby Church – Madison & 7th, AA, Alanon, Alateen, Nursery. 12:00p Brown Bagger (AC, O, WC) Serenity Shack, 117 N. Ohio St.
5:00p Happy Hour (AC, O, WC) Serenity Shack, 117 N. Ohio St.
8:00p Grapevine Group, (O, L, AC) Rosecrance Moreland, 2302 Moreland Blvd. Last Saturday: Speaker Mtg. 10am Attitude of Gratitude (CL) New Life Apostolic Church 2055 E. Harrison 2nd Saturday: Speaker Mtg. 7:00p Circle of Friends (O) 720 4th St.
10:00a Recovery Room (O) 1205 S. 9th. 9:00p Saturday Night Live (O, WC, AC) First United Methodist Church, 1920 Richmond Ave.
12:00p Brown Bagger (O, WC) Serenity Shack, 117 N. Ohio St.
9:00a Looney Toons (CL, L, AC, WC) Quest Methodist Church 2004 Philo Rd. 4:30p Many Paths (Agnostic, Secular, O, L, AC, WC) Unitarian Universalist Church, 309 W. Green St.
8:00p Grapevine Group (O, L, AC) Rosecrance Moreland, 2302 Moreland Blvd. 10:00a Primary Purpose (BB, O, AC, WC) Serenity Shack, 117 N. Ohio St.
12:00 Brown Bagger (AC, O, WC, ST) Serenity Shack, 117 N. Ohio St.
6:00p Solutions (CL, L, AC, WC) Serenity Shack, 117 N. Ohio St.